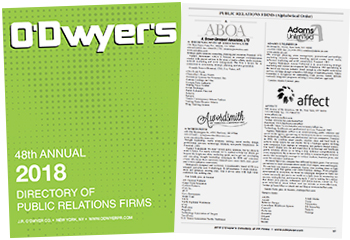 O'Dwyer's is the #1 source for researching public relations firms and outside PR counsel. 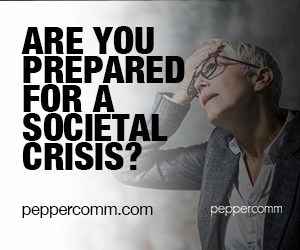 We've been connecting clients and PR firms for 48 years through our printed and online directory of PR firms. O'Dwyer's is the only place you can look up a client (e.g., Microsoft, Nike, Starbucks) and determine its outside PR counsel. Results will show the client name you searched for with links to PR firms in our database that have done work for that client. Try out our client search! For guidance on picking a PR firm, read Jack O'Dwyer's article: How to hire and get the most from outside PR counsel. To help clients shop for PR and wind up with legitimate outside PR counsel, O'Dwyer's ranks PR firms each year by net fees. Those firms which have satisfied the O'Dwyer ranking rules – supporting fee and employee totals with income tax and W-3 forms and providing a current account list – have a rankings seal next to their name throughout our database. 640 Fifth Ave., 8th flr. 230 Park Avenue South, 6th flr. 37 W. 28th St., 12th flr. 1700 Market St., 29th flr. 757 Third Ave., 20th flr. 1750 New York Ave NW, 3rd flr. 8009 34th Ave. South, 11th flr.